EDMONTON, Alberta (CNS) — Pope Francis is a radical reformer who is facing enemies — inside and outside of the church — opposed to at least some parts of his agenda, said a prominent church historian. Massimo Faggioli, an expert on the Second Vatican Council and the author of several books, said the pope is not a liberal who exalts the individual as the center of the world and who sees a minimal role for the church in public life. 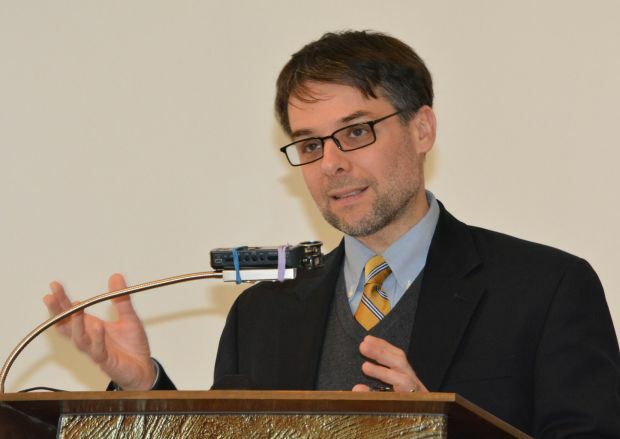 Faggioli is a theology professor at the University of St. Thomas in St. Paul, Minnesota, and the author of several books, including “Pope Francis: Tradition in Transition,” which will be published by Paulist Press in May. The Anthony Jordan Lectures are put on by Newman Theological College with support from the Oblates of Mary Immaculate. Pope Francis, Faggioli said, sees himself as having two mandates for reform. The first mandate he received from cardinals at the March 2013 conclave, which made him its surprise choice for pope. That mandate is to deal with problems of Vatican finances, corruption, sexual abuse and curial reform, Faggioli said. There is consensus on the need to carry out that type of reform, and the pope faces no significant opposition to implementing it, he said. “From the very beginning, however, he made it clear that he had another mandate that was not coming from the conclave or the institution.” That is his “popular mandate,” Faggioli said, that arose out of his experience as archbishop of Buenos Aires. It also includes dealing with new issues that have arisen since the Second Vatican Council, such as the role of women in the church, the family and marriage, he said. It further includes his creation of the nine-member Council of Cardinals that meets every two months to help him govern the church. In the past, whenever something new was created in the church, it was still within the Curia, he said. Instead, six of the nine members of the pope’s council are cardinals who head or have recently retired as head of dioceses. Some bishops at Vatican II in 1963 wanted to create a council similar to the one Pope Francis launched, but received a secret letter from the Vatican secretary of state telling them they had no right to propose such a thing, Faggioli said. “We project that they are powerful and they are not,” he said. A cardinal saying he would resist the pope if the pope undermines church unity is “something new; it’s unprecedented,” he said without naming specific cardinals. The historian said he has never seen such opposition to the pope in any recent pontificate. “This is something that worries me,” he said. Typically, those opposing Pope Francis are those who “have been saying for decades that the most important thing about being Catholic is to obey the pope. But when they receive a pope they don’t like, they become liberal Catholics,” he said. In his talk, Faggioli also spoke of opposition to the pope in Europe that comes from “the non-Catholic intellectual economic establishment,” including corporate and media leaders. These people see Pope Francis as a liberation theologian who challenges “a certain way of understanding the world through the point of view of the Western establishment,” he said. Faggioli predicted this fall will be a key time for Pope Francis. His encyclical on the environment is due to be released in the summer, his September visit to the United States “will be the most delicate visit of the pontificate so far,” and the world Synod of Bishops on the family will take place in October. I think the Pope is an egotistic maniac bent on making his own ‘church’ it is absolutely visible in his ‘hiring and firing’ anyone and everyone who gets in his way. I stand on my belief Pope Francis is guilty of being a Heretic and is guilty of acts of heresy such as commented above, he ‘fired the curia’ by building his posse of 9. He knows not one iota of Catholicism in America. You will we my name first when the petitions start circulating. It is already on a couple. I have been Catholic since conception by Catholic parents and on and on in the history of both sides of my family. Thank God my Italian immigrant grandparents are not alive to even hear a whisper about gays receiving sacraments. Just the word should not be a part of our language. Remove the Pope from office is my final word. At a time when the Catholic Church is declining in most areas of the world for non economic and social justice reasons, including across all of South America, Pope Francis seems oblivious and continues to forge ahead with his South American “popular mandate” that emphasizes greater economic and social justice and a dependency on bureaucratic, wasteful and many times corrupt governments to redistribute wealth. But wealth distribution and poverty and hardship are not the reason why the Church is loosing Catholics. A secularized pacified and fearful of offending anyone Catholic Church is. Do you think if the Catholic Church proclaimed to the world what it is, the One True Religion, it would be loosing Catholics? Do you think if today’s Church was consumed with the Holy Spirit and went forth with zeal, conviction, tenacity, and absolute confidence that it would be shrinking? If today’s Church still believed, like the first Apostles and St. Paul and all the early Church Saints believed, that the Church’s prime directive, as commanded by Jesus Christ Himself, was to go forth and convert the world to Catholicism – to save souls, today’s Church would be growing in numbers and relevancy. Instead the Church flock is thinning and scattering. This Francis received the same mandate as the original Francis: rebuild a Church falling into ruin. The creation of the nine-member Council of Cardinals that meets every two months to help Pope Francis govern the church. It certainly does not sound like they are moving at breakneck speed. Then again we are talking about the Vatican.